Below are some training examples I've done throughout my 20+ year career in training and development. You'll find a mix of written solutions, elearning, and video-based solutions. I develop with Articulate Storyline, Articulate Studio, Adobe Captivate, Lectora, Camtasia, Screenflow, and edit videos in Final Cut Pro X. Feel free to check out the rest of my site for more examples of my work as well. I’ve spent the majority of 2018 creating dozens of interactive training videos for telecommunications giant Avaya. I’ve specialized in their healthcare segment and in this example, combined Vyond animations with live video to describe customer scenarios. Other solutions include rapid video development for case studies, promotions, and product training. I can’t share due to non-disclosure agreements. 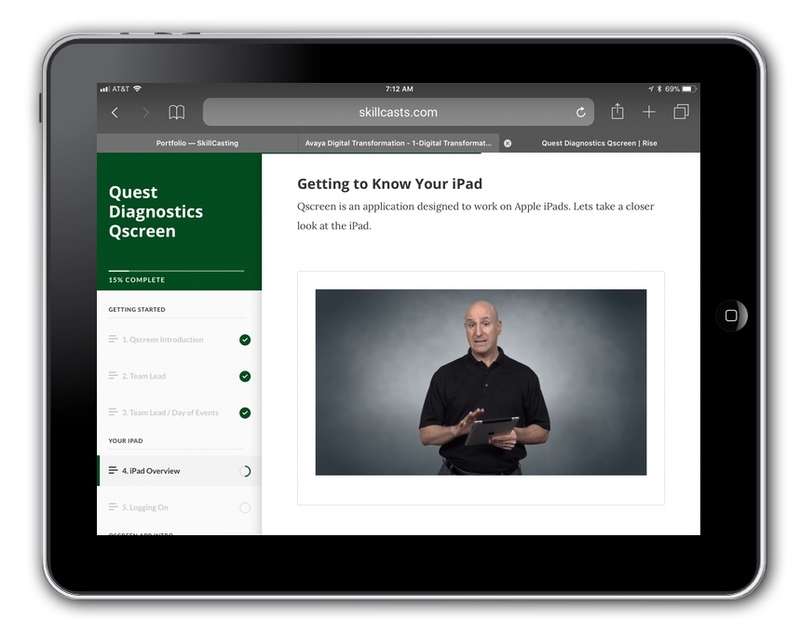 Quest Diagnostics was rolling out a new iPad app to 5000 contractors in the field and needed to get them trained. I devised a strategy and developed 18 micro-learning videos wrapped in Articulate Rise for access on laptops, iPads, and mobile phones. I wrote, delivered, and edited all the videos too. I can't share due to non-disclosure agreements. A software application developer was supporting their users with server based MS Word documents. I articulated a strategy, wrote the proposal, and implemented the solution with an online help system consisting of videos, screencasts, and all their documents into a searchable solution. I primarily develop in Articulate tools and have my own subscription to Articulate 360 including Storyline. In this example piece, I demonstrate the flexibility of the layouts and design. These solutions work well on desktops, laptops, tablets, and smartphones if designed right. Contact me for custom learning examples. Since I develop with Articulate tools primarily, I have access to Articulate Studio including Engage and Quizmaker. For one client, I created something similar to this example where I embedded a series of custom videos I wrote and produced for them into Engage elearning objects. We then uploaded these to their LMS for training compliance tracking. Contact me for custom video solutions. In a previous role, I was manager of product and sales training for Sprint E|Solutions. 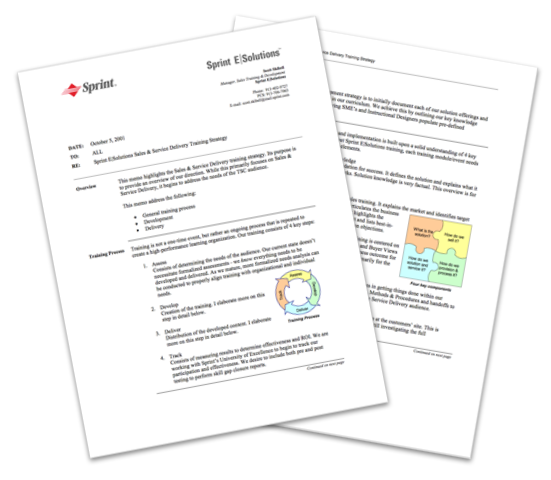 This is the training strategy document I wrote for this start-up business unit within Sprint. This document set the direction for all of our sales and sales support training. You can download the full document here. This is a whitepaper I wrote on Mac screencasting for a now-defunct site. I've done a lot of screencasting and have guest blogged and spoken at TechSmith on different screencasting techniques.